Donald Trump doesn't have Silicon Valley in his corner. 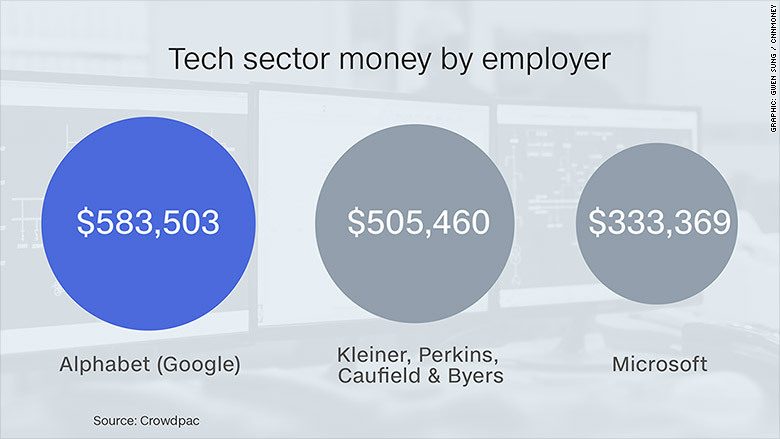 There are just 52 tech industry workers who have made political contributions to Trump, according to data from Crowdpac, which rates candidates based on things like speeches, voting records and campaign finance data. It pulled data for CNNMoney on reported political contributions, including SuperPAC donations, from workers at some 200 tech companies. These include firms like GE (GE) and Microsoft (MSFT), as well as startups like Uber and venture capital firms that invest in the tech sector. People report where they work, so while an Uber driver isn't technically an employee, if someone self identifies as "Uber driver," Crowdpac counts them in the tech category. The data reveals which tech companies have the most workers contributing to political campaigns and which presidential candidates are getting the most support from the tech industry. 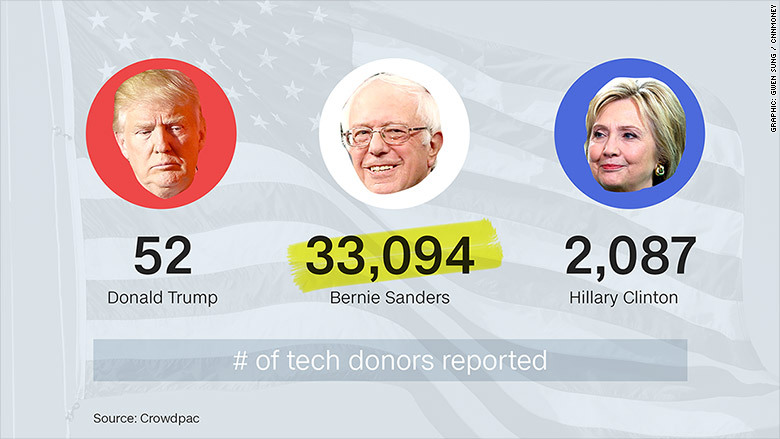 Bernie Sanders had by far the most donations from the tech industry -- $6 million from more than 33,000, according to Crowdpac. Hillary Clinton, meanwhile, received $2.6 million from about 2,000 donors. Trump's 52 donors contributed just over $21,000. "With any industry, the biggest thing they dislike is uncertainty. Trump is just a big, giant hurricane of uncertainty," said Reed Galen, a political strategist who has consulted with tech companies. "You don't know what he'll say or do next. I'm not sure that he does, necessarily." Trump has also rubbed some of tech's biggest leaders and executives the wrong way, from Apple's (AAPL) Tim Cook to Amazon's (AMZN) Jeff Bezos. In February, Trump called for a boycott of all Apple products until the company turned its cellphone records over to authorities. Trump "has all the makings of an authoritarian leader," added Galen. "If he believes you should do something, he believes you should do it because he wants it, whether or not you're happy about it." Moreover, Trump's remarks about African Americans, women, and Latinos and Muslims are in stark contrast to Silicon Valley's fight for a more inclusive industry. "The tech community has a consistent and ongoing problem -- both in perception and reality -- that it is still mostly a white male community," said Galen. "[Trump's values] are not what they want to be seen as espousing or believing in." While Trump doesn't have heavy financial support from the tech industry, there are other industries where he's "performed much better" said Mason Harrison, political director at Crowdpac. This includes finance and insurance, healthcare providers, and real estate. It's also important to note that Trump has largely self-funded his campaign. Sanders has reported the most donations from tech industry workers -- but he also tends to report more donations because he includes donations of all sizes. Campaigns aren't required to go public with donor information for those who contribute less than $200. Sanders, however, uses a fundraising tool, ActBlue, which is legally required to show contributions of all sizes. Crowdpac's data show that Clinton donors give a lot more on average than Sanders' supporters.